PorcSalt, the project of Chef Matt Ridgway in Rosemont, N.J., and Rooster Street Provisions, owned by Tony and Kristina Page in Elizabethtown, Pa., are doing things with meat that are new and yet old, and all thoroughly delicious—hand-crafting charcuterie in small batches and building careers around this culinary scientific art. And both companies are transparent about the origins of their meat, sourcing from farms with flawless records of raising animals responsibly and humanely. 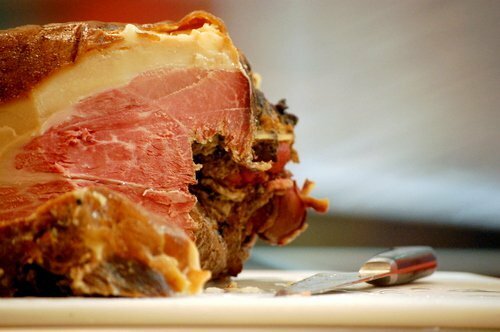 Charcuterie refers to methods of processing meats (often, but not always pork)—brining, smoking, salting-curing, fermenting and sausage-making—as well as more obscure preparations, such as confit, roulade, pâté and terrine-making. 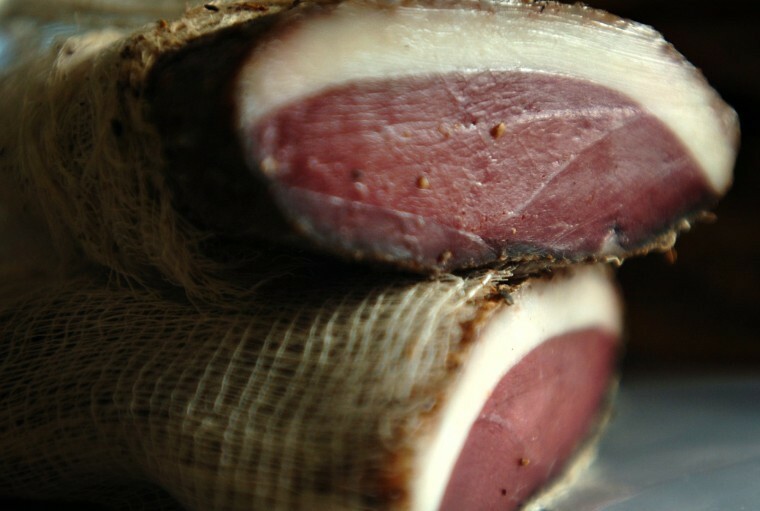 Charcuterie is to meat what cheese is to dairy: a molecular metamorphoses that amps up the flavor of the raw ingredient. But like many food preparations, charcuterie’s origins were more about function than flavor—first employed to preserve meat in the time before refrigeration. Even after the advent of refrigeration, the charcuterie tradition was carried on in classical French restaurants, where the garde manger chefs (French for "keeper of the food") are tasked with transforming leftover or unwanted meat into dishes that patrons will pay for. These days, charcuterie is gaining in popularity as food lovers start to explore the other bold flavors cured meats have to offer. In 2008, Matt Ridgway was feeling burned out. After working a decade in kitchens in Philadelphia, Atlanta and New York, he moved to his parent’s home in Bucks County. He built a smokehouse in the backyard, established relationships with local farmers and began curing and smoking bacon under the name PorcSalt. The bacon quickly grew in popularity, and he soon found himself filling wholesale orders for restaurants across the region. But while being busy is usually a good thing for a small business, Ridgway says the volume of orders outpaced his ability to grow, and ultimately the operation became unsustainable. “Wholesaling is all about economies of scale. You either have to do a small amount or a large amount—there is no medium,” he says. Part of this is because of USDA regulations, which impose strict and often expensive guidelines for making food products, especially those involving meat. In addition, managing logistics just became too much for one person to handle. So in May of 2013, he changed direction and opened The Pass, a small French-inspired restaurant in Rosemont, N.J., just a few miles north of Lambertville. When The Pass is closed during the day, a small PorcSalt retail counter at the front is open for business. The success of the restaurant has allowed Ridgway and his partner Paul Mitchell to make charcuterie while remaining financially solvent. 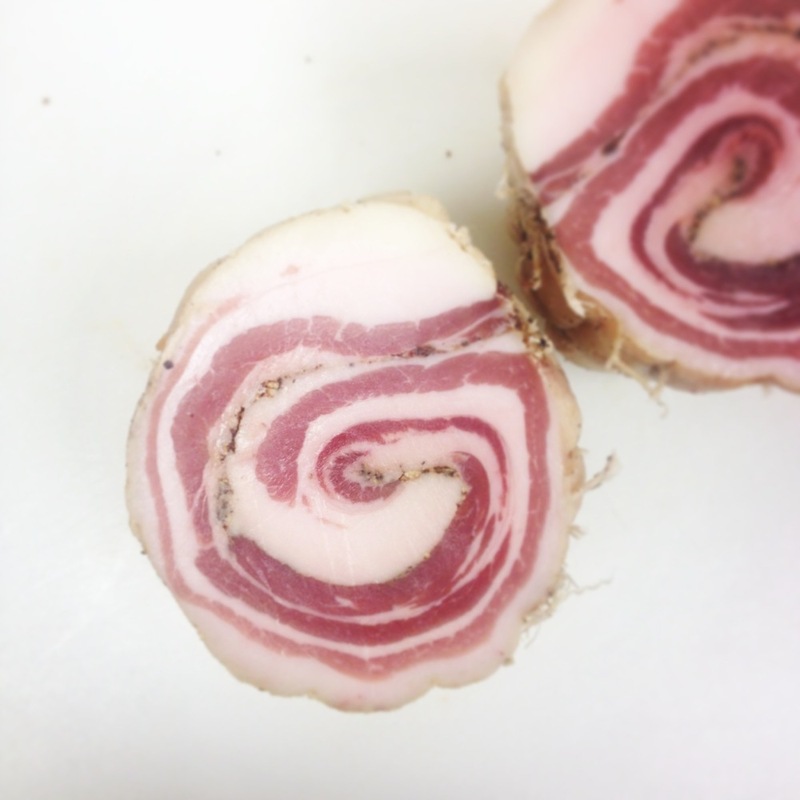 In addition to locally made products, wine and honey-cured bacon, PorcSalt sells house-made pancetta, pork rillons, ham terrines, duck prosciutto, foie gras and other carefully preserved meats. Ridgway’s goals include renovating an old barn behind The Pass into a USDA-approved facility to ramp back up the wholesale arm of the business. “We’d love to do charcuterie all the time, but we wouldn’t make it. You can’t just sell bacon and live, we’d be closed in a week,” he says. In the meantime, he sells at the HeadHouse farmers market (Second and Lombard streets) and maintains a few wholesale accounts, including the original DiBruno Brothers shop on 9th Street in the Italian Market. Two and a half years ago, Tony and Kristina Page were vacationing in Paris when they came across a little butcher shop on the Île Saint-Louis. At the store crowded with locals, meat hung from the ceiling, charcuterie filled the cases and butchers cut meat to order. Moved by the authenticity, they knew they wanted to capture this experience and bring it back to the U.S. In late 2012, the Pages opened Rooster Street Provisions, a butcher and charcuterie shop, in Elizabethtown, Pa.. Tony brings over 13 years of culinary experience to the kitchen, and Kristina uses her communications and graphic design background to manage marketing and pubic relations. While opening the business came from their love of cured and aged meats, Tony says there was a moral imperative as well. The Pages challenge their customers to eat more than just pork chops or belly and they buy and butcher whole pigs and turn every part from head to tail—snouts, ears, hearts, kidneys, livers—into products for sale. Rooster Street is committed to sourcing pasture-raised, hormone- and antibiotic-free animals from family farms, such as Rettland Farms in Gettysburg and Sweet Stem Farm in Litiz, Pa. “We truly believe that a happy pig makes a tasty pig,” Tony says. From these pigs, they make a variety of handcrafted charcuterie, including saucisson sec (a French-inspired dried sausage), slow-smoked liverwurst, guanciale, headcheese and bacon. Other locally produced goods, such as cheese and pickles, are also sold in their shop and at the Lancaster Central Market. Alex Jones, product manager at the Fair Food Farmstand, said that when she discovered Rooster Street Provisions, she was “heartbroken” when she realized that she wouldn’t be able to stock their charcuterie at the Farmstand because it would have to come from a USDA-inspected meat processing facility—not really possible for most small butchers and farms because of cost. “It's maddening because their stuff is so delicious!,” she says. Last March, she invited Tony and Kristina to teach charcuterie basics at as part of Fair Food's education series, “If we can't have a producer making these products right here in Philly, at least people will know where to find them,” Jones says. 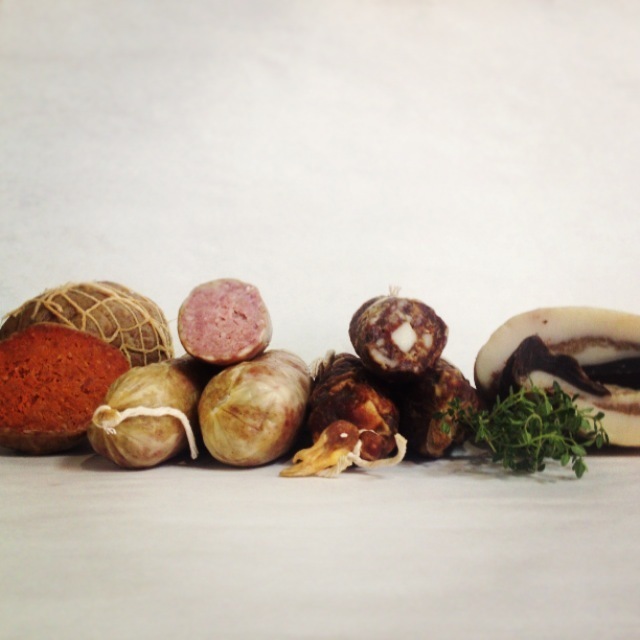 Looking for craft charcuterie closer to home? Scope the menus at Amis, Russet, Southwark, Supper and Amada. Also, 1732 Meats, a family-run charcuterie company based in Lansdowne, Pa., sells their bacon and pancetta at DiBruno Brothers, the Fair Food Farmstand, and every second and fourth Saturday during the summer at the Lansdowne Farmers Market.